Studio Line: MGM - Beings from Another Dimension have invaded your world. "The very oddest good movie in many a full moon," Buckaroo Banzai combines "humor, imagination, a little oriental mysticism and a passel of sharp performances [into] very chic sci-fi" (Time)! Oscar® nominees Peter Weller and John Lithgow team with Emmy® winners Ellen Barkin and Christopher Lloyd for a fiendishly clever, action-packed adventure in an outlandish world you'll want to visit again and again! Brilliant brain surgeon Banzai (Weller) just made scientific history. Shifting his Oscillation Overthruster into warp speed, he's the first man ever to travel to the Eighth Dimension… and come back sane! But when his sworn enemy, the demented Dr. Lizardo (Lithgow), devises a plot to steal the Overthruster and bring an evil army of aliens back to destroy Earth, Buckaroo goes cranium to cranium with the madman in an extra-dimensional battle that could result in total annihilation of the universe! DVD: Widescreen 2.35:1/16X9; audio English Dolby Digital 5.1, French Monaural; subtitles French, Spanish; closed-captioned; single sided - double layered; 16 chapters; rated PG; 102 min. ; $19.98; 1/2/02. Supplements: Alternate Opening; Audio Commentary With Director W.D. Richter and “Reno”; Deleted Scenes Archive; Character Profiles; Banzai Institute Archives; Photo Gallery; “Jet Car All Access”; Pinky Carruthers' Unknown Facts; Teaser Trailer; Enhanced Nuon Features; New Jet Car Trailer. When it comes to cult movies, The Adventures of Buckaroo Banzai Across the Eighth Dimension stands as one of the biggies. The movie totally tanked during its theatrical release in 1984; as I recall, it received some positive acclaim, but audiences didn’t respond to it. The film stirred just enough of a reaction to interest me when it came out on video. As I recall, I watched about 10 minutes of the flick and decided to quit. It seemed excessively bizarre and incoherent and I wasn’t interested in it. That was a long time ago, so I figured that the film’s new DVD release would be a good time to give it another shot. Banzai tells the story of its eponymous hero, played by Peter Weller. A true renaissance man, we first meet Buckaroo as he performs brain surgery. He then rushes off to race his jet car through a mountain and into the eighth dimension. While the experiment is a success, unfortunately it stirs the interest of alien called Red Lectroids. They fought Black Lectroids years ago, and the only man prior to Banzai to enter the eighth dimension was taken over by one of them; back in 1938, Dr. Emilio Lizardo (John Lithgow) apparently went mad after the experiment, though really his seeming lack of sanity results from the internal battle between his own personality and that of Red Lectroid Lord John Whorfin. Anyway, Whorfin/Lizardo wants to return home so he and his Red Lectroid cohorts steal the oscillation overthruster, the main tool that powers the interdimensional capabilities of the jet car. This might not sound like a bad thing, but the Black Lectroids really don’t want this to happen, so they threaten to destroy the Earth if the Reds aren’t stopped. It’s up to Buckaroo and his gang from the Banzai Institute to make things right. While unquestionably an odd little film, Banzai doesn’t seem quite so “out there” to me these days. Perhaps that’s because a lot of weird flicks have emerged over the last 17 years; Banzai doesn’t stand out as much as it did. That doesn’t mean it can’t be a confusing story; in fact, I’m pretty sure the filmmakers went out of their way to offer a semi-disjointed flick. Events happen with little reason, and the whole thing feels pieced together in a consciously erratic manner. Director W.D. Richter appears to throw down the gauntlet and challenge the audience: if you can’t hang onto the tale, then we don’t want you in our club. At its heart, however, Banzai is actually a simple tale of the battle between good and evil. It’s just that Richter dresses it up in unusual clothes. Banzai clearly should be seen as a spoof on action-adventure flicks, especially in regard to its titular hero. Not only is Buckaroo an excellent brain surgeon and a brilliant scientist, but also he leads a successful band, the Hong Kong Cavaliers (which happens to feature other Banzai Institute staff as well). Handsome and dashing too, Buckaroo’s an absurdly ideal man who fits into the movie’s warped world-view. Many opine that Banzai is a film that one either loves or hates, but I disagree, largely because I neither loved nor hated it. On the positive side, it did seem like something different, though the self-conscious element was a bit of a negative. Banzai was one of those movies that tried very hard to be unusual; some of its oddness didn’t come naturally. This meant that a few of the jokes felt forced and overplayed. For example, the famous “why is that watermelon here?” bit just came across as weirdness for the sake of weirdness. In addition, one of the better gags that involves the “short form” for the Declaration of War suffered from too much explanation; it would have worked better if it stayed in the background. A bland performance from Peter Weller didn’t help, and the movie’s glee in jokes about a character named “Bigboote” got old. Add to that some weak pacing and one of the cheesiest Eighties synth scores and you have a flawed flick. However, it wasn’t one beyond redemption. Even with some of the forced oddness, any film that tried to be something unusual deserves some credit, and Banzai definitely succeeded in that regard. I imagine that this is a movie that would improve upon repeated viewings, as it seemed to have a high rewatchability quotient. Even after only one screening, I could tell if provided a slew of quotable lines. Some were annoyingly glib and obnoxiously cryptic - like Buckaroo’s trademark “no matter where you go, there you are” - but others - such as Lizardo/Whorfin’s “laugh-a while you can, monkey boy” - stood as more memorable. Actually, Lithgow’s performance as the conflicted Lizardo/Whorfin was one of the best elements of Banzai. He chewed the scenery with absolute gusto. While such tendencies came across as cloying and smarmy during his TV show Third Rock From the Sun, they worked here, as he made his dual role consistently bizarre and entertaining. ”Bizarre and entertaining” also sum up The Adventures of Buckaroo Banzai Across the Eighth Dimension to a large degree. I don’t know if the movie deserves its obsessive cult audience, but it seems reasonably compelling and amusing. Some parts of it haven’t aged particularly well - oy, that score! - but it holds up nicely for the most part. I don’t see it turning into a favorite, but I can understand much of the film’s appeal. 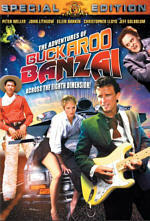 The Adventures of Buckaroo Banzai Across the Eighth Dimension appears in an aspect ratio of approximately 2.35:1 on this single-sided, dual-layered DVD; the image has been enhanced for 16X9 televisions. While not without a few concerns, the picture generally looked quite positive. Sharpness usually came across as acceptably crisp and distinct. Some wide shots demonstrated mild softness, but these were rare. For the most part, the movie seemed detailed and accurate. A few examples of moiré effects occurred, and I also saw some modest edge enhancement at times. Print flaws appeared fairly minor for an older film. Occasionally I detected some speckles and a little debris, but overall, the image seemed rather clean and fresh based on the movie’s vintage. Many Eighties movies featured somewhat heavy and blotchy colors, and those concerns periodically affected Banzai. Much of the movie showed nicely bright and vivid hues, but sometimes they seemed a bit runny and muddy. Black levels came across as deep and rich, however, and shadow detail was appropriately heavy but not excessively thick. Overall, the movie provided a generally satisfying visual experience, and for fans weaned on prior pan and scan video renditions, this widescreen effort will come as a revelation. Even better was the Dolby Digital 5.1 soundtrack of Banzai. Taken from the original stereo source material, the mix didn’t reinvent the wheel, but it seemed to expand the material nicely. The forward soundstage appeared fairly broad and engaging. Elements seemed to be well placed within the spectrum, and they meshed together cleanly and naturally. Music showed good stereo separation and presence, while effects were accurately located. Surround usage tended toward general reinforcement, but it did so neatly; the rear channels added a good layer of ambience to the package. It wasn’t a spectacular soundfield, but it worked well for the material. Audio quality also appeared reasonably good for the era. Dialogue could be a little thin at times, but the lines generally came across as natural and distinct, and I heard no concerns related to intelligibility or edginess. In regard to the effects, high-end response occasionally seemed a bit weak, but most of the track appeared clear and accurate, and bass response seemed surprisingly deep and tight. Music also showed good fidelity and dynamic range, as the cheesy score sounded clean and rich. Overall, Banzai offered a very strong soundtrack for a film of its vintage. As proof that studios do pay attention to cult audiences sometimes, Banzai comes packed with many extras. Actually, one of these can be viewed on its own or integrated into the film itself. We find an Alternate Opening With Jamie Lee Curtis. This four-minute and 23-second clip can be accessed from the supplements menu, and we’re also given the option to watch the “theatrical version” or the “extended version” when you elect to start the film. The scene is good from the point of view that it helps set the stage for the rest of the flick. However, it may be too obviously expository for some, and I’d guess that’s why it didn’t make the final product. By the way, Curtis is nearly unrecognizable here; if I didn’t know it was her, I wouldn’t have figured it out by watching the scene. Banzai provides two forms of commentary. We get a standard audio commentary from director W.D. Richter and writer Earl Mac Rauch. Actually, the latter is never identified on the DVD itself. The case states that Rauch’s involved, but the commentary itself claims to include Richter and “real-life” Banzai associate Reno Nevada. Is this Rauch as Reno or is it actor Pepe Serna - who played Reno in the film - or is it some unknown third party? The consensus of others seems to be that it’s Rauch as Reno, but it remains intentionally confusing. This leads me into one running conceit you’ll find throughout the DVD’s extras: everyone involved refuses to acknowledge this was a fictional tale. Richter takes the attitude that Banzai was a “docu-drama” and he never breaks from that tone at any point during the DVD. Fans may well find this to be charming, but frankly, I thought it seemed exceedingly cutesy, and it got really old really quickly. Happily, I didn’t hear too much of that during the surprisingly solid Richter and “Reno” commentary. On the negative side, I didn’t care for the silly discussions of the Banzai “facts” behind the film, and the track includes a few too many long gaps. However, when Richter talks about the making of the movie, he offers quite a lot of interesting details. Most compelling are the issues that relate to his battles with the studio; not surprisingly, they badly wanted to transform this quirky piece into a standard action blockbuster, and Richter tosses in some of his experiences in that regard. “Reno” doesn’t add much, especially since almost all of his statements come in character. In an amusing aside, however, he does point out some looping during one of Weller’s singing scenes. Overall, the “docu-drama” conceit marred this track, but although I normally hate that kind of stuff, I still found enough worthwhile information to allow me to enjoy the commentary. In addition to Richter’s audio track, we find Pinky Carruthers’ Unknown Facts, an unusual text commentary. Instead of the traditional piece that offers factoids about the film, this one mainly provides details about the fictional characters. As with the commentary - and many other elements of the DVD - it treats the enterprise as though Banzai it retold a factual tale and gives us trivia about the “true” events. A few movie-related tidbits appear as well, but all exist in this alternate universe. I’m sure fans of the flick will enjoy this, but unlike the audio commentary, I thought it bordered on becoming insufferable and it didn’t do much for me. Next we find a documentary called Buckaroo Banzai Declassified. This 22-minute and 45-second program follows a somewhat unusual structure. For its first three minutes and 55 seconds, we watch a featurette from 1984 that mixes movie clips and on-set interviews with director Richter and actors Paul Weller, Ellen Barkin, John Lithgow, Carl Lumbly, Pepe Serna, Lewis Smith, and Clancy Brown. After that, we get new material from Richter who leads us through a discussion of the film that also includes effects-oriented archival snippets from crewmembers Tom Burman, Greg Jein, and Steven Dane. They explain and demonstrate their work, and we also see some videotaped behind the scenes material. The latter elements are the most interesting aspect of “Declassified”. They offer nice looks at make-up tests, jet car footage, and other more technical elements of the production. Richter maintains a somewhat scattered focus as he covers topics such as his rough cut of the film, and he continues to stick with the “docu-drama” tone found elsewhere. Overall, the program includes some decent behind the scenes material, but it seems a little flat and uninformative as a whole. Within the Deleted Scenes Archive we discover 14 unused. Virtually all of these append existing segments of the finished film. Clips from a roughcut have been integrated with final footage, so the quality of the material jumps frequently. Each of the pieces lasts between 23 seconds and two minutes, 45 seconds, with a total running time of 14 minutes and three seconds. Since each of the clips starts with text introductions that run about six seconds each - which eats up roughly 84 seconds of the total - and a lot of the footage comes from the final film, this means we really don’t find a lot of new material in this section. Overall, the additions are very short and quite minor. I’m sure big fans will be delighted to see the new stuff, but none of it seems to add to the experience. The New Jet Car Trailer was created in 1998 in an attempt to interest studios in a proposed new Buckaroo Banzai TV show called Ancient Secrets and New Mysteries. The computer-animated clip lasts for two minutes and 24 seconds and really exists as a teaser. It just shows the jet car as it speeds around some different situations, so it doesn’t reveal much about the prospective program. Nonetheless, the diehards will likely be excited to see it. After a 76-second teaser trailer we find Buckaroo Banzai Personal Profiles. This splits into five areas: “The Musician”, “The Lover”, “The Scientist”, “The Man” and “The Adventurer”. Each includes short text about that part of Banzai’s personality. A similar feature appears under Buckaroo Banzai Character Profiles. There we find another bio for Banzai himself as well as listings for Reno Nevada, New Jersey, Dr. Emilio Lizardo, Lord John Whorfin, Rawhide, Penny Priddy, Perfect Tommy, Pinky Carruthers, John Parker, Lo Pep, Hanoi Xan, the Lectroids, and Toichi Hikita. These are brief but moderately fun discussions of the characters, and some - such as the listing for Penny - actually relate their post-movie fates. Like the “Banzai Personal Profiles”, Jet Car - All Access divides into five subdomains. We find “Statistics”, “Jet Engine”, “Cockpit”, “Overthruster”, and “Design”. Mostly these areas include text as well as drawings and some photos. Amusingly, “Overthruster” actually provides mathematical equations! As with much of the DVD, this area probably enters overkill territory for casual observers, but the big fans will likely adore it. The Photo Gallery divides into eight subsections. We find “1930s”, “1950s”, “Behind the Scenes”, “Buckaroo”, “Hong Kong Cavaliers”, “Jet Car”, “Lectroids”, “Penny”, “Scenes” and “Villains”. These include between five and 61 stills for a total of 156 images. They vary between publicity stills and production shots, but they seem reasonably interesting as a whole. If nothing else, you have to love the shot of a Lectroid behind the camera! Lastly, a slew of additional materials appears in the Banzai Institute Archives. This also splits into a bunch of smaller areas. Technical Data gives us “Schematics of Tour Bus” with seven drawings, and “Schematics of Complex 88”, seven screens of information about “Banzai Institute West”, a place allegedly created years after the filming of the movie. Within the Movie Archive area we find three subdomains. “Movie Tie-ins” offers 29 screens of ads and images of related books, videos, and other merchandise. “Film Locations” adds five screens that simply list places where the movie was shot. “Movie Reviews” gives us a positive text from the New York Times and a more ambivalent one from the Hollywood Reporter. Hong Kong Cavaliers CD Covers shows five of their albums and also lists the songs for each one. Finally, the Historical Archives packs additional material. The “Buckaroo Banzai Interview” provides a fairly long chat between Banzai and Reno Nevada that appears to have been created in the early Nineties. “Banzai Radio” includes an October 2000 chat between original movie publicist Terry Erdmann and former co-worker - and interviewer - Denise Okuda that lasts for about 10 minutes. “Institute History” gives us four screens of text about it, while “Badges” offers three images. “Hikita’s Diary” ends with 11 screens of text that relate the professor’s thoughts. Actually, I suppose my “lastly” was premature, for the DVD includes a few other materials. For the six and a half people out there with machines that can access them, Banzai provides Nuon Enhanced Features. I don’t fall into that category, and most likely, neither do you, so that’s all I can say about that. In addition, Banzai tosses in a mix of Easter eggs. In the main menu, click up and to the left to highlight a circle. Press “enter” and you can check out 36 screens of alternate DVD menu designs. In addition, if you click on the middle jet car in the top row of the main menu, you can read 10 different quotes from Banzai and others. If you head to the “Special Features” area and enter the “Deleted Scenes” domain, click on the watermelon at the bottom of the screen. This gets you a “news story” about Institute attempts to feed the needy by dripping watermelons from a helicopter. From the second screen, you can find another egg. Click on the “BB” logo in the lower right corner and you’ll get a 95-second clip in which Richter talks about the movie’s watermelon scene and also reveals part of the recipe for “chicken in a watermelon”. Finally - as far as I can tell - if you go into the “Banzai Institute Archives”, click on the “BB” logo in the lower right corner and you can check out two alternate DVD cover designs. The Adventures of Buckaroo Banzai Across the Eighth Dimension boasts a small cult, but they’re a rabid group. While I thought the movie was somewhat interesting, my screening of it didn’t initiate me into their ranks. Still, the film seems bizarrely spirited and entertaining, so I didn’t mind the time I spent with it. The DVD offers generally solid picture and sound as well as some reasonably compelling extras; I could have lived without the pretension that Banzai is a true story, but the disc packs a lot of decent content nonetheless. While clearly not for everyone, Banzai is just odd enough to merit a look, especially with a bargain list price of only $19.98.